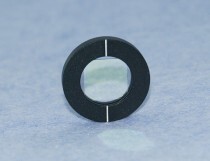 Time delay compensators are made of calcite crystals or alpha-BBO crystals to compensate the time delay between two specified wavelengths with orthogonal polarizations. The time delay between the fundamental pulses and harmonic pulses is introduced in a second harmonic generation (SHG) crystal as a result of the group velocity mismatch (GVM) in the crystal. A time delay compensator generates an opposite GVM and therefore can be used to improve the overlap of the pulses for the subsequent process (e.g. third harmonic generation, THG in a second nonlinear crystal). The time delay is adjustable by rotation of the compensator. The specified delay ranges are based on a rotation of +/-12o (external). A larger rotation can be applied for an extended delay range if there is no problem of beam clipping by the edge of the compensator.